The next in Glenn’s series of demo releases When Daylight Appears covers his demos from 1985-1991. So that’s the fourth out of five. What do you think the final one will be called? 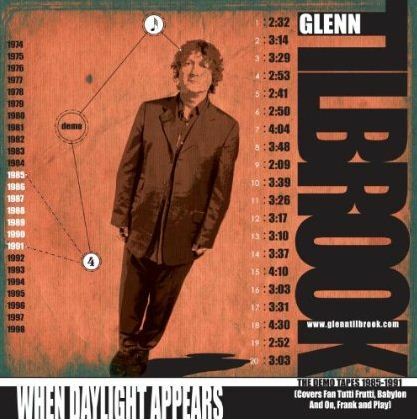 11 Responses to "When Daylight Appears – the latest demos CD from Glenn Tilbrook"
I’ve got a sense of deja vu. Okay, the last demo CD is called “Malicious Gossip”? ‘Malicious Gossip’? I don’t think that would ever profit, especially when hearsay is its foundation. So that fifth CD with the Demo Tapes 1981 – 1984 (with 21 tracks covering Sweets From A Stranger and Difford & Tilbrook). What would it be called? Would it be a line from a track from SWAS? For example “Today Is None Of Our Concern”? Perhaps “No Damage Was Done”? or The Joy of the Pain”? Mmmm… some great suggestions here. I like “The Cure of the Can” too. You’ve not guessed it yet! Any more suggestions? – especially those that describe the period and the music! I didn’t read your post correctly. From what I remember, which isn’t a lot, it was dominated by the new romantics and electropop. The period? Dunno. Depends which side of the haves and have nots you were on. The only song I can think of on SFAS with romantic in it is Points Of View. Am I getting warm? So, I’m Wrong Again and obviously talking Mumbo Jumbo. For me, the period is summed up by the words “Pour Me Another One”. GLENN’S LOST SLEEVE NOTES FINALLY SUFACE!!! Well, I don’t know about you, but I was disappointed with the non-specific nature of Glenn’s sleeve notes for his latest demos installment ‘When Daylight Appears’. They felt like they’d been written in a hurry and without much thought as to what the fans might want to know. After all, it’s only the fans who buy this kind of product. So, to remedy this (and for a laugh) I’ve imagined what he would have written had he not been under pressure from the CD pressing plant. Enjoy! By 1985 I found myself demoing songs, assuming they’d be used for the ‘difficult second’ Difford & Tilbrook album. By this time I’d invested in some state-of-the-art recording gear and, having had the freedom of new production techniques unencumbered by the Squeeze tag on the D&T record, I fully embraced the concept of programmed keyboards and the technology of the time. This translated into an over-produced sound on the newly reformed Squeeze record, with little room for spontaneity. There were some good songs though. Hits of the Year is a much lighter pop confection in its original form. It certainly became more memorable once Chris rewrote the lyrics to tell the story of the hijacking of an aircraft. It’s easy to see why Lover’s Tree never made the cut on Cosi Fan Tutti Frutti – it belongs to an era that was long gone at that stage (it wouldn’t have sounded out of place on East Side Story). I remember the day when Chris handed me new lyrics to Baby Town. Our co-producer on Babylon And On – Eric ‘ET’ Thorngren – had a bee in his bonnet about the song, feeling the story of a couple debating whether to have a baby or not could have been bettered. Chris had just read a book about the tough love method of dealing with addiction and the words spilled out on the page for him. Tough Love is now one of my favourites from this period. My vocal on Striking Matches doesn’t come close to Chris’. There are some songs of ours that were made for him and this is definitely one of them. Don’t know if I can say the same for the only demo from Frank included here – Love Circles. This one was a single. Would it have been a hit had I sung it? It certainly sounds poppier here – who knows? And so to the songs from Play. At this point we’d been dropped by A&M and signed by Reprise and, consequently felt we had a lot to prove. You can tell by the work I put in to these demos! We recorded the album in LA with Tony Berg and, by and large, he gently pushed the songs in the right direction. He felt the tempos of Walk a Straight Line and The Day I Get Home were too fast. You can hear I was having fun with a banjo on the latter, lending the song a distinct bluegrass flavour. Tony slowed it down to mid-tempo (and I ditched the banjo! ), which in the end fitted with the overall production sound of the album. Finally, Happiness is King (which ended up as a b-side) morphed into Wicked and Cruel in the studio, a happy accident. I eventually stole the theme of this lyric for my song Best of Times. Just don’t tell Chris! Adrian, that is pure genius!